Soft-Switch PBX – a Hosted Phone System that completely replaces your proprietary PBX for a low monthly fee starting at just £9.99 per month with unlimited phone extensions included in both the Standard and PRO Editions of the Hosted Phone Systems.The Soft-Switch Hosted Phone System web-based administration makes management easy. Soft-Switch PBX allows users to easily setup phones at any location without the need to modify onsite firewalls/routers making Soft-Switch PBX an ideal solution for multi-office deployments and for staff working from home. Soft-Switch Hosted Phone System gives you the ability to have phone numbers from almost any town / city within the UK. You can even transfer existing telephone numbers over to the Hosted Phone System to further reduce costs. The Soft-Switch Hosted Phone System saves money by avoiding the need for expensive ISDN Lines or SIP Trunks as our Hosted Phone System connects directly to our SIP Network. With the use of SoftPhone Applications from Counterpath and Zoiper for Mobile Phones, Tablets and desktop/laptop computers, you will be able to receive calls at the office and on the move. The Soft Switch PBX provides all the features that help grow your business and stay in contact with customers easily and with our Hosted Phone System platform being part of a cluster across multiple data centers you can enjoy a phone system that will be available when you need it. Support is included with our Hosted Phone Systems, so if you are not sure how to set up a feature or you have an issue, give us a call or send an email, we are here to help. Thanks to a service agreement with Yealink. If you have existing or new Yealink IP Phones which you would like to use with our Soft-Switch PBX service, all we will need from you is the MAC Address of the phone and when instructed, factory reset the phone. The Phone will then reboot and connect to the Soft-Switch PBX without any involvement from you. Soft-Switch PBX is more than just a typical hosted PBX offering features you will not find elsewhere at such a great price. Soft-Switch PBX is great for call centres with the built-inauto dialer and agent reports makes Soft-Switch PBX a good choice. 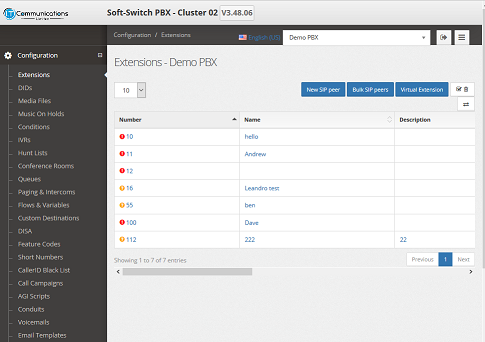 Soft-Switch PBX also includes drillable reports so you can review call volumes with ease. Do we have to pay for support and or maintenance? No. Basic support Monday to Friday 9am to 5pm is included at no additional cost. We do not charge for updates to the service. Are we required to pay for SIP Trunks? No, due to SoftSwitch PBX being our own service. It is directly connected to our VoIP Gateways. Can we upgrade/downgrade the service during contract? Yes, you can upgrade or downgrade during the contract and you will be invoiced/credited back any pro-rata service fees from the day the upgrade/downgrade is completed. We prefer the Yealink Brand of IP Phones as the range of phones have been tested with the SoftSwitch PBX and we believe these to be good value and easy to use. For our current call rates, please click here. We will send you an invoice on or shortly after the 1st of each month. This will detail all the service charges and cost of calls. The total invoice amount will then be collected by direct debit on or shortly after the 15th of that month. Does Soft-Switch PBX support Soft Phones? Do i have to pay any setup fees? No, we will never charge you any setup fees except for Gold Telephone Numbers and Number Porting Fees. There is a 12-month minimum term contract with all new accounts and phone numbers. After the initial term, you can give us 30 days’ notice to cancel the services without any disconnection fees.